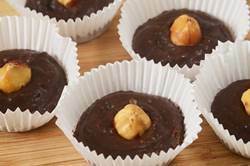 Hazelnut Ganache Cups are a rich and elegant, bite-sized petit four made with a creamy mixture of semi sweet chocolate, heavy cream, and ground hazelnuts. The mixture is chilled, piped into pretty paper candy cups and then each ganache cup is garnished with a whole toasted hazelnut. They are perfect for the holiday season as they can be stored in the refrigerator for several weeks or else frozen. These are best served at room temperature. Now, the taste and quality of the ganache is primarily dependent on the quality of chocolate you start with. Remember not all chocolates are the same. Chocolate begins with the beans from the tropical tree Theobroma which translates to "Food of the Gods". There are three types of cacao beans (Forastero, Criollo, and Trinitario) and the type and/or blend of beans, their quality, and where they are grown all contribute to the quality and taste of the chocolate. Other factors affecting taste and quality are how the beans are roasted, how the beans are ground into a mass called chocolate liquor, how much extra cocoa butter is added to the chocolate liquor, quality and amount of other ingredients added, and how long the chocolate liquor is conched (processed). A chocolate with a velvety smooth texture will produce a ganache that is velvety smooth. However, the most important point to consider when choosing either a bittersweet or semi-sweet chocolate for making your ganache, is whether you like the chocolate when eaten out of hand. 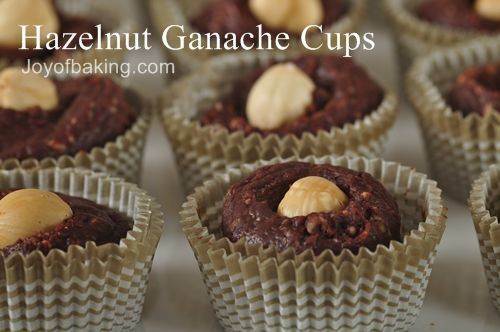 Hazelnut Ganache Cups: Preheat oven to 350 degrees F (177 degrees C). Bake the hazelnuts for 10 - 15 minutes or until the skins start to blister and the nuts are fragrant. Remove from oven and wrap the nuts in a clean towel and steam for 5 minutes. Rub the towel briskly to remove the skins. Let cool. Remove 60 hazelnuts to be used as garnish and then place the remaining cooled hazelnuts in a food processor and process until finely ground. Set aside. Coarsely chopped the chocolate and place in a heatproof bowl. In a small saucepan bring the cream to a boil. Immediately, remove from heat and pour over the chopped chocolate. Gently stir the mixture until smooth and then add the alcohol (or vanilla extract) and finely ground hazelnuts. Cover with plastic wrap and refrigerate the mixture until thick but not solid (about 30 minutes). Transfer the mixture to a pastry bag fitted with a large plain tip and pipe the ganache into small candy cups until they are 3/4 full. Place a toasted hazelnut, pointed end up, on top of each cup. Chill the ganache cups until they are firm (about 1 hour). Store in an airtight container in the refrigerator for several weeks or they can be frozen for a few months. Best served at room temperature. Makes about 60 1-inch (2.5 cm) ganache cups. Bloom, Carole. 'Truffles, Candies, & Confections'. The Crossing Press. Freedom, CA: 1992. Yard, Sherry. 'The Secrets of Baking'. Houghton Mifflin Company. New York: 2003.